Fiberglass or glass fiber is material made from extremely fine fibers of glass. The resulting composite material, properly known as fiber-reinforced polymers (FRP), is called "fiberglass" in popular usage. Fiberglass is used for mats, insulation, reinforcement for various polymer products, and industrial fabrics that are heat-resistant, corrosion-resistant, and high in strength. Glass fiber is formed when thin strands of silica-based or other formulation glass is extruded into many fibers with small diameters suitable for textile processing. Glass is unlike other polymers in that, even as a fiber, it has little crystalline structure. The properties of the structure of glass in its softened stage are very much like its properties when spun into fiber. One definition of glass is "an inorganic substance in a condition that is continuous with and analogous to the liquid state of that substance, but which, as a result of a reversible change in viscosity during cooling, has attained so high a degree of viscosity as to be for all practical purposes rigid." Glassmakers have long used the technique of heating and drawing glass into fine fibers. Yet, the mass manufacture of fiberglass was made possible only with the advent of finer machine-tooling. In 1893 Edward Drummond Libbey exhibited a dress at the World's Columbian Exposition, incorporating glass fibers with the diameter and texture of silk fibers. That material, however, was not the same as what we know as "fiberglass" today. The first commercial production of fiberglass was in 1936. In 1938 Owens-Illinois Glass Company and Corning Glass Works joined to form the Owens-Corning Fiberglas Corporation. Until that time, all fiberglass had been manufactured as staple. When the two companies joined together to produce and promote fiberglass, they introduced continuous filament glass fibers. Owens-Corning is still the major fiberglass producer today. The material is marketed under the trade name Fiberglas, which has become a genericized trademark. The basis of textile grade glass fibers is silica (SiO2). In its pure form, it exists as a polymer, (SiO2)n. It has no true melting point but softens up to 2,000 °C, whereupon it starts to degrade. At 1,713 °C, most of the molecules can move about freely. If the glass is then cooled quickly, they will be unable to form an ordered structure. In the polymer, it forms SiO4 groups, which are configured as a tetrahedron with the silicon atom at the center, and four oxygen atoms at the corners. These atoms then form a network bonded at the corners by sharing the oxygen atoms. Within silica-based glass, each silicon atom is directly bound to four oxygen atoms that occupy the corners of a tetrahedron. Although pure silica is a perfectly viable glass and glass fiber, it must be worked with at very high temperatures, which is a drawback unless its specific chemical properties are needed. It is usual to introduce impurities into the glass in the form of other materials, to lower its working temperature. These materials also impart various other properties to the glass which may be beneficial in different applications. The first type of glass used for fiber was soda-lime glass or A-glass. It was not very resistant to alkali. A new type, E-glass, was formed, that is alkali free (< 2 percent) and is an alumino-borosilicate glass. This was the first glass formulation used for continuous filament formation. E-glass still makes up most of the fiberglass production in the world. Its particular components may differ slightly in percentage, but must fall within a specific range. The letter E is used because it was originally for electrical applications. S-glass is a high strength formulation for use when tensile strength is the most important property. C-glass was developed to resist attack from chemicals, mostly acids which destroy E-glass. T-glass is a North American variant of C-glass. A-glass is an industry term for cullet glass, often bottles, made into fiber. AR-glass is alkali resistant glass. Most glass fibers have limited solubility in water but it is very dependent on pH. Chloride ion will also attack and dissolve E-glass surfaces. A recent trend in the industry is to reduce or eliminate the boron content in the glass fibers. Since E-glass does not really melt but soften, the softening point is defined as, “the temperature at which a 0.55–0.77 millimeter diameter fiber 9.25 inches long, elongates under its own weight at 1 mm/min when suspended vertically and heated at the rate of 5 °C per minute.” The strain point is reached when the glass has a viscosity of 1014.5 poise. The annealing point, which is the temperature where the internal stresses are reduced to an acceptable commercial limit in 15 minutes, is marked by a viscosity of 1013 poise. Properties (CE): "Fiberglass is strong, durable, and impervious to many caustics and to extreme temperatures." By trapping air within them, blocks of glass fiber make good thermal insulation, with a thermal conductivity of 0.04 W/mK. Glass strengths are usually tested and reported for "virgin" fibers which have just been manufactured. The freshest, thinnest fibers are the strongest and this is thought to be due to the fact that it is easier for thinner fibers to bend. The more the surface is scratched, the less the resulting tenacity is. Because glass has an amorphous structure, its properties are the same along the fiber and across the fiber. Humidity is an important factor in the tensile strength. Moisture is easily absorbed, and can worsen microscopic cracks and surface defects, and lessen tenacity. In contrast to carbon fiber, glass can undergo more elongation before it breaks. The viscosity of the molten glass is very important for manufacturing success. During drawing (pulling of the glass to reduce fiber circumference) the viscosity should be relatively low. If it is too high the fiber will break during drawing, however if it is too low the glass will form droplets rather than drawing out into fiber. There are two main types of glass fiber manufacture and two main types of glass fiber product. First, fiber is made either from a direct melt process or a marble remelt process. Both start with the raw materials in solid form. The materials are mixed together and melted in a furnace. Then, for the marble process, the molten material is sheared and rolled into marbles which are cooled and packaged. The marbles are taken to the fiber manufacturing facility where they are inserted into a can and remelted. The molten glass is extruded to the bushing to be formed into fiber. In the direct melt process, the molten glass in the furnace goes right to the bushing for formation. The bushings are what make the capital investment in fiber glass production expensive. The nozzle design is also critical. The number of nozzles ranges from 200 to 4000 in multiples of 200. The important part of the nozzle in continuous filament manufacture is the thickness of its walls in the exit region. It was found that inserting a counterbore here reduced wetting. Today, the nozzles are designed to have a minimum thickness at the exit. The reason for this is that as glass flows through the nozzle it forms a drop which is suspended from the end. As it falls, it leaves a thread attached by the meniscus to the nozzle as long as the viscosity is in the correct range for fiber formation. The smaller the annular ring of the nozzle or the thinner the wall at exit, the faster the drop will form and fall away, and the lower its tendency to wet the vertical part of the nozzle. The surface tension of the glass is what influences the formation of the meniscus. For E-glass it should be around 400 mN per meter. 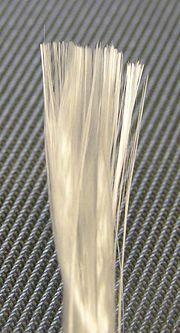 In the continuous filament process, after the fiber is drawn, a size is applied. This size helps protect the fiber as it is wound onto a bobbin. The particular size applied relates to end-use. While some sizes are processing aids, others make the fiber have an affinity for a certain resin, if the fiber is to be used in a composite. Size is usually added at 0.5–2.0 percent by weight. Winding then takes place at around 1,000 meters per minute. End uses for regular fiberglass are mats, insulation, reinforcement, heat resistant fabrics, corrosion resistant fabrics and high strength fabrics. Plastics reinforced with fiberglass can be molded into various shapes or flattened into sheets and then used as structural materials for roofing, ceilings, automobiles, motorcycles, boats, and aircraft. Fiberglass fabrics, being heat resistant, are useful for industrial purposes; they are also used for making curtains and drapery. ↑ 1.0 1.1 1.2 1.3 1.4 1.5 Loewenstein, K. L. (1973). The Manufacturing Technology of Continuous Glass Fibers. New York: Elsevier Scientific, 2-94. ISBN 0444411097. ↑ 2.0 2.1 2.2 2.3 Gupta, V. B. and V. K. Kothari (1997). Manufactured Fibre Technology. London: Chapman and Hall, 544-546. ISBN 0412540304. ↑ 3.0 3.1 3.2 3.3 Volf, Milos B. (1990). Technical Approach to Glass. New York: Elsevier. ISBN 044498805X. ↑ 4.0 4.1 4.2 4.3 Lubin, George (ed.) (1975). Handbook of Fiberglass and Advanced Plastic Composites. Huntingdon, N.Y.: Robert E. Krieger. ↑ Mohr, J. G. and W. P. Rowe (1978). Fiberglass. Atlanta: Van Nostrand Reindhold, 13. ISBN 0442254474. Loewenstein, K.L. (1973). The Manufacturing Technology of Continuous Glass Fibers. New York: Elsevier Scientific. ISBN 0444411097. Gupta, V.B. and V.K. Kothari (1997). Manufactured Fibre Technology. London: Chapman and Hall. ISBN 0412540304. This page was last modified on 7 April 2017, at 19:47.